I have had an interesting week. 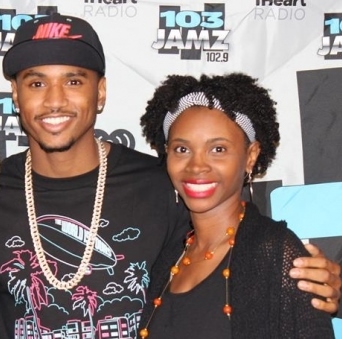 Anyone who knows me knows I am a Trey Songz fan, so when I found out he was coming to the Hampton Roads, VA area to do a meet and greet/album listening party, I made it my mission to find a way to win tickets. I usually have 103 JAMZ playing in the background as I work during the day and this station happened to be the one hosting this particular event. So, I tried to call in and be the 10th caller 3 times with no luck. Since I could not get through via telephone, I entered my e-mail address online and hoped for the best. I typically don’t win contests, so I pushed it to the back of my mind and carried on. But, I got the call that I wanted yesterday from the radio station saying I would get two tickets to attend. SUCCESS! Today, I left work early and headed over to a local comedy club in Virginia Beach. The atmosphere was nice, there was good food (chicken wings – I love when people have “real” food), and Trey’s new album Trigga was playing in the background. While I waited, I shot a quick text to one of the radio personalities with a question about doing an all- “Trey’s Angels” concert or tour. She replied back that she would ask, so I was looking forward to an answer. Then, Trey took pictures with his fans, gave out hugs, and it was over. The meet and greet didn’t last long, but it was an overall great experience. It made me think of the first time I met Trey a few years ago when I was a freshman in college and he was a new face on the scene and rocking cornrows. He was a nice and humble person then and he continues to be the same person now!